REI Half Dome 4 was a very easy, seemly sturdy set-up tent. But does have some flaws. REI Half Dome 4 was a seemly sturdy, very easy set-up tent. But does have some flaws. My wife and I tried the REI Half Dome 4 for a three-night camping trip at Yosemite last week. The tent was spacious for two persons and will be very tight for four adults (the floor space will accommodate 4 adult sleeping pads with no place to store anything and walking without stepping on someone else’s pad). This is due to no fault of REI; rather seemed to be industry standard rating system. The tent came with a nice carry bag but did not include the optional footprint. The tent weighs in at 7lb. 12 oz. and the fly weigh in at 14 oz. REI claims the weight can be divide amount 4 people on a backpacking trip; I personally do not want to backpack with this relatively heavy tent, rather I have a Big Agnes Seedhouse 2 superlight weight tent for backpacking. 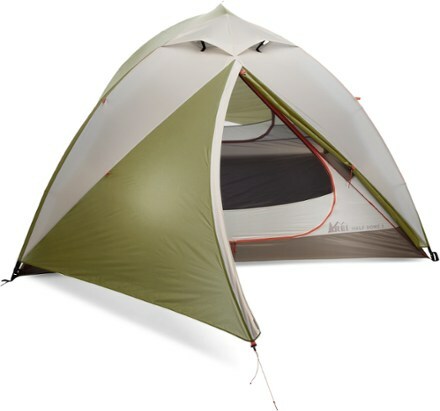 I bought the REI Half Dome 4 for car camping with a bit more space and comfort. The tent was easy to set up, I particularly like the color-coded poles and pole clips that made the first time set-up much easier. However, the assembly of “dual-hub architecture “ was a bit confusing from just reading the brief instructions printed on the storage bag. It is very simple once you have done it one time. My advice is for any newbie to watch the setting up video from YouTube prior go on the trip. My trip to Yosemite was in July with over 100-degree daytime temperature and in the upper 70’s during the nights. With the rain fly attached, by opening the 4 vents, we were comfortable and at one point actually needed a blanket. Due to limited usage, I cannot speak about how water and wind proof of the tent. One disappointment was due to the guylines were not reflective, we had tripped over the guylines many times during the nights. Speaking of guylines, there were only two attached to the two vestibules; rest of the guylines was unattached to the fly. I would much prefer the guylines to be permanently attached as in my Big Agnes tent. Overall, I rate the REI Half Dome 3.5 stars. 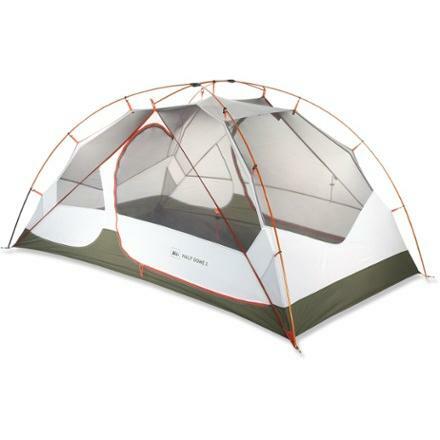 It is a good tent for the value (especially if you can catch a sale), but it could be better. In a free-standing dome tent, the guylines are often unattached - Many people don't use them at all unless they are expecting a major storm. In fact, it sounds like the flaws you mention are, like the floor space calculation, 'industry standard'. REI is really great in that they provide lots of extra guylines and stakes, but attacvhing all of them isn't necessary in all but the absolute worst weather. My camp dome 4 is the perfect size of car camping with a spouse and I rarely use any of the guylines (I do stake down the corners.) I have been in extremely windy conditions and used two guylines, although I am not sure I even needed them. To use the, I think 6, that are provided seems like it would require a hurricane, but I appreciate that REI provides them since other makers will need a couple guylines and not provide any. And if not used, they aren't a trip hazard. I do add short, 6", guylines to the tabs on the rainfly at both ends of the tent. This improves ventillation and prevents the fly from sticking to the tent from dew. 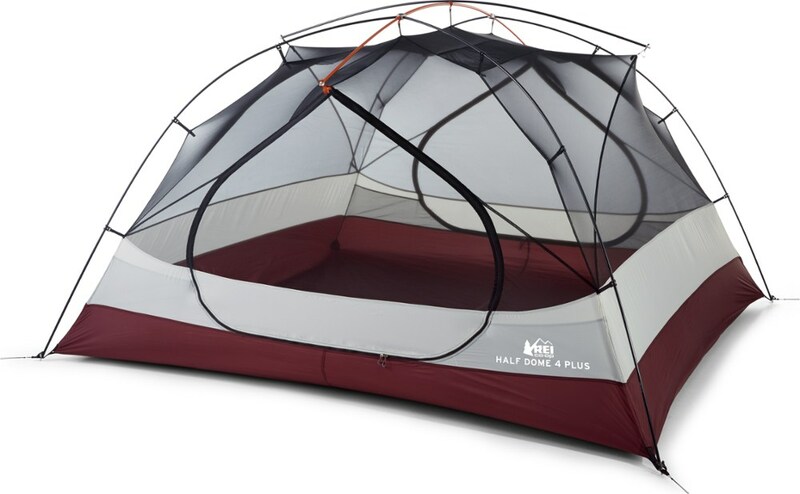 The REi Half Dome 4 is a well engineered, high performing piece of equipment. 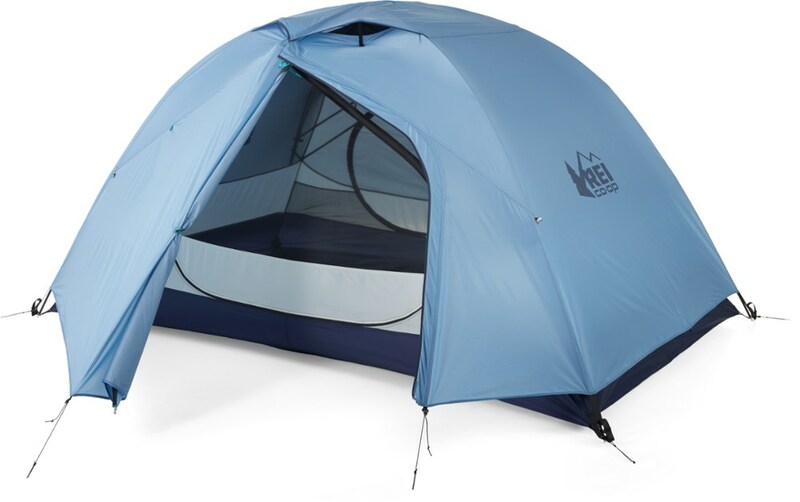 In 2013, REI released an updated model of its popular Half Dome tent that sports several improvements over the earlier models. The most obvious improvement is a totally redesigned door. Moving away from the two straight zipper door that always left just a little gap for insects and dust to get in, the 2013 model now sports a single arched zipper. I think that this door design makes for a slightly smaller entrance than the 2012 model, but it is plenty large enough to let you and your gear in and out easily. It is also a faster and more secure zipper arrangement. The other improvement is that REI has gone from one ventilation vent, on each side of the tent fly, to two vents. This allows for much improved ventilation and more options for controlling the ventilation. The rest of the tent appears to remain unchanged, except for the colors. 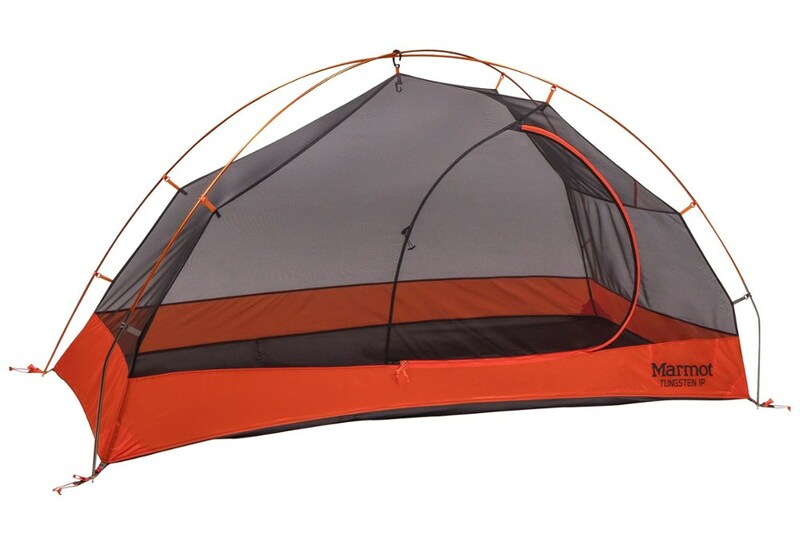 The 2013 tent is available in two new color combinations: Applemint/Boxwood that is a combination of two greens and Orange Sky/Redrock, an orange and brick red combination. I bought the Orange Sky/Redrock version and the color combination is really growing on me. It is a very nice color scheme to wake up to, however the two largest panels of the fly are white and show dirt quickly. One week of camping in the trees and my tent fly is already dirty and stained. Unfortunately, REI has totally ruined to aesthetics of the Half Dome 4 by placing a large silkscreen of their logo right in the center of the large rainfly panels. These logos are un-escapable and are the first thing that you will see when you wake in the morning. This level of commodification of the REI brand really isn’t necessary. After all, they have already sold us the tent. Why advertise to us in the wilderness. The logos would be better if they were smaller and located down in the corners. My other big gripe about the Half Dome 4 is the corner pockets. The long thin shape of the pockets is great for eyeglasses and a toothbrush, but not really usable for anything else. The two large pockets along the ceiling have ample room, but are somewhat difficult to access. 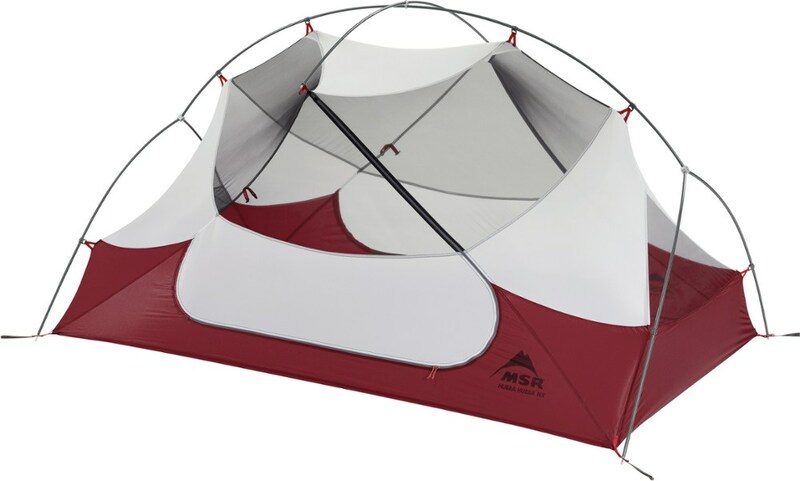 There is certainly ample room in the tent for two to four good size pockets for small gear. 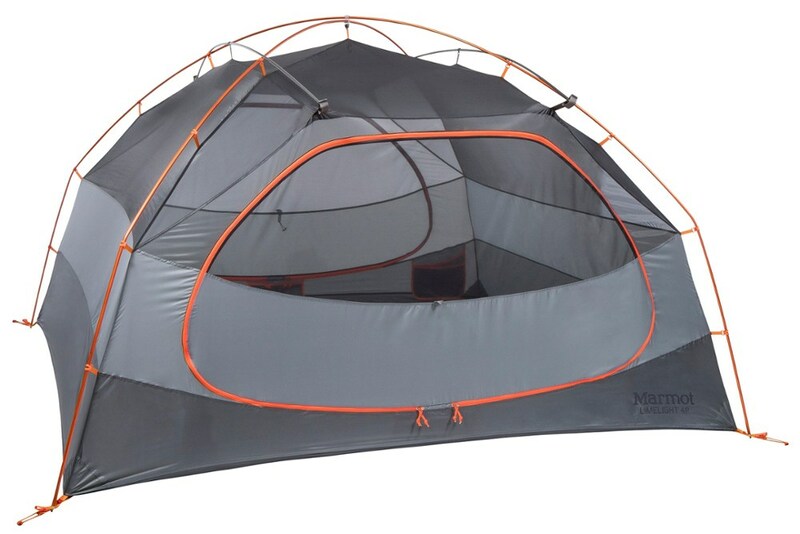 One important thing to be aware of with this tent, its design exposes two very large, flat surface areas to the wind. When you are pitching the Half Dome 4 in a heavy wind, make sure that the corners are staked down first, and then attach the tent body to the poles from the bottom up. The Half Dome 4 pitches easily, and a single person can have it set up in 5 minutes. I have just camped through the 300 night marker in my 2013 REI Half Dome 4, and I am still very happy with this tent. It is still in great condition and has a lot of nights left in it. My 300 nights of experience with this tent has been split between high desert and woodland camping, and the Half Dome 4 has performed well in both environments. Although the Half Dome 4 isn’t as architecturally pleasing as my all time favorite REI tent, the Taj 3, it is still a very pleasant environment to wake up in. When REI updated the Half Dome 4, in 2013, they changed from two straight zippers on each door, to a single arched zipper. I had some trepidation about this change, as I have seen issues with curved zippers and had to return an early 2013 Half Dome when one of the door zippers blew out. However, REI covered the damage and gave me a new tent. I don’t know if the first tent just had a defective zipper or if REI upgraded the zippers, but the replacement tent hasn’t had any zipper problems. I only have a few minor complaints about the Half Dome 4. The tent lacks usable storage pockets. There is a long, narrow pocket in each corner that is almost useless. They do work for long narrow items and a water bottle might partially fit in, but not much of anything else.The waterproof coating on the rainfly is a bit sticky which causes the aluminum poles to squeak when they rub against it when the wind is blowing.The zippers on the vestibules are single pull one directional zippers. This severely limits your options for ventilation and privacy control.The vestibules could be a little larger. After 300 nights in this tent, I still don’t like the large REI logos printed on both sides of the rainfly. All in all, the REI Half Dome 4 is a great tent, and I highly recommend it. Welcome to Trailspace, Jon. Thanks for letting us know how your Half Dome has worked out for you. I'd love to see some pictures of it in your review. Ease of Setup: hub-pole combo makes set-up a snap! Great tent! We purchased this tent last December and have used it at least ten times this spring and summer. The interior is big enough for myself, my fiance, our two dogs, and gear. It is light enough and packs compactly enough that it can be used as a backpacking tent for shorter excursions (although we are considering a two man tent for longer trips). Great in rainy weather as well - our last camping trip involved two days of steady rain and one major thunderstorm. We stayed snug and dry inside. Rainfly provides quite a bit of insulation as well has two vents that help with interior airflow. Great purchase! AWESOME tent! Works perfectly for canoes and portage packs. Solid, watertight, yet breezy (without the rainfly)and oh so spacious! It works perfectly for the BWCA in Minnesota...especially when you don't want to play cards or board-games in a storm. The REI Half Dome 4 is not available from the stores we monitor. It was last seen November 1, 2018	at REI.